Puree all of the ingredients in a blender until a creamy consistency is achieved. Pour the strawberry mixture into the ice lolly moulds, then top up with the coconut mixture. Dip a spoon or knife all the way in and stir briefly to create a ripple effect. Seal the moulds. Freeze for 4-5 hrs. (or overnight). Melt the chocolate in a bain-marie. To decorate, remove the lollies from the moulds (dip briefly in hot water first, if necessary). 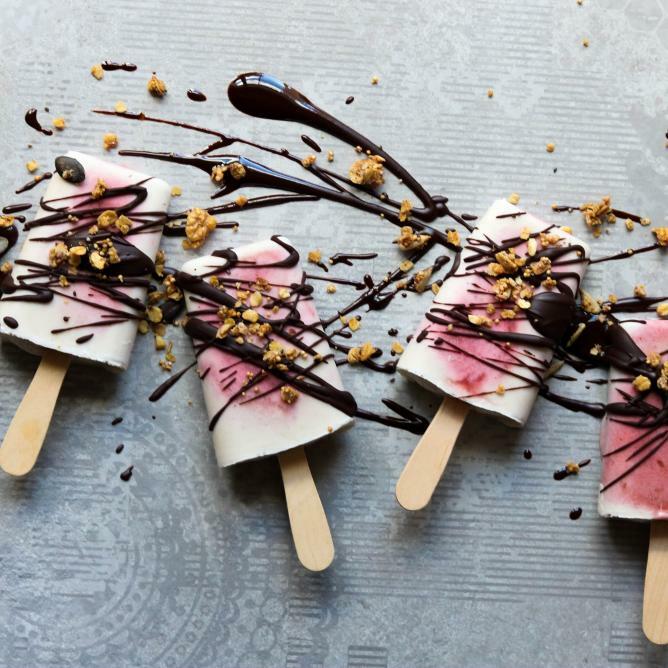 Hold the lollies by the stick and drizzle with chocolate using a fork. Freeze for a further 15-20 mins. You can also turn the strawberries into a jam to release the sugar. Cook the strawberries in a little water for around 25 mins. to create a thick jam. Add the maple syrup and lemon juice, mix and transfer to the freezer.